What Happens if You Leave Your House to a Pet in Your Will? Ross T. asks: When people leave a house to their pet cat or dog, do the pets really get the house? How are things like paying taxes and upkeep handled? To a lot of people the idea of a person leaving money in their will to a pet instead of a charity or, you know, their own family or friends, seems something only an eccentric wealthy person would do. In reality, a pet trust is not only a surprisingly common arrangement, but one most legal experts recommend for any pet owner who cares for their animal. But how do you go about accomplishing this and how do you make sure your wishes are followed? Despite sounding like something you’d need an army of lawyers to draft into a will to make sure the courts would allow such a thing, in truth, any lawyer worth their salt who has knowledge of wills should be able to relatively inexpensively add provisions to an estate plan to care for a pet. In fact, every state in America (with the exception of Minnesota) has laws on the books detailing pet trusts and their enforcement to help simplify things a little. For British readers, UK law similarly has no problem with allowing pet owners to make provisions for a pet in their will. So, yes, you can actually leave a house to a pet, though if you wanted that pet to be able to keep the house, you would need to add in some funds for necessary taxes, upkeep, and, of course, specify someone to actually take care of the animal in question and properly incentivize them to do so. As not all pets are created equal, pet owners are advised to be as pedantic as they want when it comes to laying out the terms of a pet trust and how the pet should be cared for. This can be as simple as specifying how often said pet is taken for a walk, to what brand of baby food it has to be fed. That last one is actually a stipulation taken directly from the will of singer Dusty Springfield for how her beloved cat, Nicholas, should be taken care of; so, yes, even oddball requirements can be put in. This brings us to money. For most pet owners, it is unsurprisingly advised to set aside enough money in a trust to take care of the animal in question for the duration of its projected natural lifespan in accordance with the manner of care it is accustomed to. As some people have more money than others, this is where pet trusts can get kind of silly, such as people leaving estates worth $13 million to a cat they rescued. If you do leave such an insanely valuable estate too a pet, while family members may attempt to challenge your will in hopes of getting the money for themselves, assuming you hired a reasonably competent estate lawyer to draw up the whole thing, there usually shouldn’t be any issue, though there are occasional exceptions in everything. So how does the dog or cat actually get the money you left? In short, they don’t directly. If you simply put in the will something like that you leave your cat, along with $5,000 to be used for its care, to your sister, the money will ultimately be doled out to your sister by the executor of the will and, after that, depending on the region you live, your sister may or may not be free to do with the money what she will. In fact, it may even be the case that she can leave the cat on the side of the road on the way home from the will executor’s office, if she so chooses. (That said, some regions do have statutory pet trust laws that help get around this issue, allowing you to simply say something like, “I leave $5,000 to be used for the care of my pet fish,” and be reasonably sure that things will be executed such that the money will be used appropriately.) However, just to make sure, when making simple directives like this in a will, it’s best to designate a trusted person as the caretaker and/or simply set up a pet trust explicitly. On that note, explicitly setting up a trust has another huge advantage over just bequeathing money to your pet and relying on statutory pet trust laws (if any). If you do the latter, there will be a gap between when you die and when your will goes through the probate process, potentially meaning no one is taking care of your pet in the interim. If the funds needed to care for the pet aren’t available until, say, a house is sold or the like, this might be a very long gap. By setting up the trust when you’re alive (an inter vivos or living trust), the trust takes effect the moment you die, getting around the problem completely. You may also stipulate in your will a trust be setup upon your death to your specifications, called a testamentary trust, but this suffers from the same delay period in which no one is obligated to ensure your pet’s care and no funds may be available for that care for some amount of time. In either case, as with a trust fund for a child, in this case when a pet is bequeathed an amount of money and perhaps even something like a house for its care, a trustee is appointed either by the courts or by the will holder prior to death to decide how and when potential funds get distributed. This money will invariably be paid to a designated caretaker who will physically take care of the animal in accordance with the wishes stipulated in the will. To ensure no shenanigans ensue, you may specify an enforcer should be appointed to keep tabs on how the money is being spent and ensure that no funds are misappropriated by either the trustee or caretaker. This system gives both peace of mind to a person looking to care for their pet after they die and ensures that their final wishes are respected. There’s a risk that when the cat dies, and the person doesn’t want to stop taking their [money, so] they’ll go out and buy a cat that looks exactly like the other cat so they don’t have to stop. As such, it’s recommended to do such things as include some mechanism to ensure the pet being cared for is really your former pet (even potentially requiring DNA testing of the animal upon your death and regular checkups thereafter) or potentially limiting the amount of time a trustee will pay out to a caretaker for a given pet, with the time-frame being around the likely lifespan of said pet. 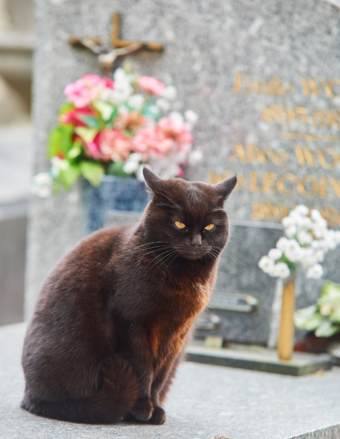 Some even opt to include an additional stipulation that will compensate the caretaker should the animal die, to help ensure they accurately report the death. This last one, of course, comes with it’s own problems in that a caretaker may decided to go all Aristocats on the dead person’s pets and try to kill them to get the lump sum sooner. This potentially necessitates further stipulations in the will to cover all such scenarios in a way that ensures your pet is cared for to your liking- again, nothing wrong with being overly pedantic in setting up such a pet trust to ensure your wishes are followed exactly, without any loopholes. At this point you might be wondering what happens to any money left over when the animal itself dies. Unless otherwise specified in the form of a remainder beneficiary being noted, it will likely be absorbed back into your estate and bequeathed appropriately from there, though if you literally did not specify at all what is to be done, there’s potential that the courts end up deciding this one, so best to be explicit here as well, if you care. Whether you specify a remainder beneficiary or not, this may provide another risk-factor to your pet from particularly unscrupulous individuals. For instance, if you were to leave a house and appropriate funds to your cat and give the rest of your estate to, for instance, your cousin (or similarly, if you explicitly stipulated that once the cat died, the cousin gets any remaining funds), this gives that person incentive to “accidentally” run over the cat or feed it antifreeze or the like. To get around the issue, it’s not uncommon for people to stipulate that remaining funds simply go to a non-profit organization like an animal shelter or the like. On that note, we should address what happens if the amount of money you leave an animal is so exorbitant that it gets challenged in court by those who feel the money should have gone to them. While normally this shouldn’t be a problem at all if everything was setup right, it can occasionally be for outside reasons. For an example of this, we’ll refer to perhaps the most famous example of animal nepotism, Trouble the dog. Formerly owned by the so-called “Queen of Mean”, eccentric billionaire businesswoman Leona Helmsley, Trouble was a Maltese bequeathed $12 million after Helmsley’s death in 2007. Upon this particular stipulation being contested (owing to it being determined that Helmsley was mentally unfit when the will was written), a judge famously ruled that this amount was far greater than was needed to care for the dog, even taking into account its lifestyle of being hand fed things like fresh crab cakes and steamed vegetables. Instead, the judge awarded the dog, who it should be noted was already fairly elderly for the breed at 12 years old (the average Maltese lives 12-15 years), a more conservative $2 million. The other $10 million originally designated was given to two of Helmsley’s grandchildren (total of $3 million each), who she had disinherited for unspecified reasons unlike her other grandchildren who all received large sums, and the remaining $4 million went to the Harry B. Helmsley Charitable Trust. Beyond the dog suddenly losing $10 million, the new caretaker of Trouble, Carl Lekic, the general manager of Helmsley Sandcastle Hotel, famously switched from feeding Trouble her high end fare to simply giving her run of the mill canned dog food. As for the rest of the money, this amount not only paid for her now mostly common dog food (to the tune of about $100 a month), but also care (grooming at an astounding $8,000 per year, medical bills at $2,500-$18,000 per year owing to her kidney and other health problems, and caretaker fee at $60,000 per year) and full time security ($100,000 per year). If this last seems odd, it should be noted that the well publicized dog was the frequent recipient of death and kidnapping threats and even had to travel under an alias at one point for her own protection. At this point you might be wondering what happens if the money in the trust runs out and the pet is still living. In this case, it’s common to simply let the caregiver decide what happens, perhaps continuing to care for the animal if they want or perhaps not. However, if you’re not comfortable leaving it up to said individual, you may specify exactly what you want done here as well, such as giving the animal to a no-kill shelter or the like, in hopes that they’ll be able to find it a new home with someone who will care for it of their own volition, rather than because of some financial incentive. Who Gets the Royalties for Hitler’s Book? WHAT HAPPENS WHEN SOMEONE LEAVES MILLIONS TO A PET? Whoopsadoodle. 🙂 Thanks for catching that. Fixed!